A big game for both teams since both really need a win to get out of the group stage. Not quite ready for a depressing cocktail or a celebratory drink yet. But what would calm the nerves and soothe the rough edges? A Pimm's Cup actually sounds like a good answer, but that's what I drank last match and look how that turned out. This time, a good old pint of bitter could do the trick. 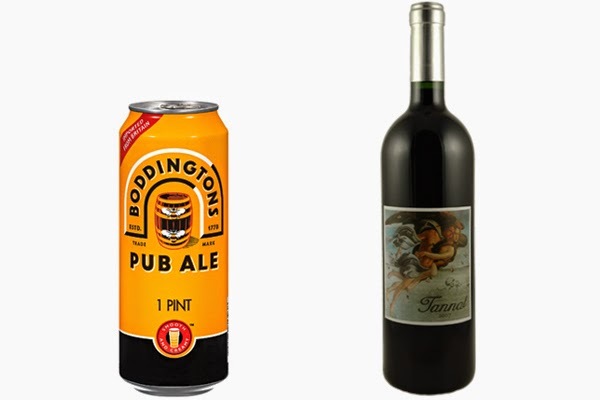 A cask ale would be perfect, but at home, I am a little partial to the cans of Boddingtons since the beer comes out smooth and creamy. If I was heading out for a pint in New York City, I'd be on the look out for Wandering Star, which is made by a Brit in Pittsfield, MA. You can find them all around NYC, but the Blind Tiger not only sells Wandering Star, but a whole slew of beers. It's going to be a beer vs. wine match this afternoon. Red wine from Uruguay means drinking Tannat, which tends to result in powerful reds. The Vientos 2008 Tannat shows lots of dark fruits and some tannins. Sounds kind of perfect for pairing with a steak.